One of the ways we can mark the year 2018 is as the year that the #AngryAsians motif truly flowered. In a previous post, I discussed how, in terms of political orientation, Asian-Americans have been trending leftward in recent decades, but a wider sense of resentment within certain vocal elements of the Asian community is leading a substantial cohort of Asian-Americans to “ally” with boilerplate grievance groups (e.g., blacks, Hispanics) and to appropriate the same anti-white rhetoric of these groups. But for those rare Asians who explore Wokeness Studies in between STEM classes, the sky’s the limit… especially in terms of trumped up ‘microaggressions’. The normal and expected growing pains of being a second-generation immigrant (from virtually any country) — where one had to navigate, sometimes clumsily, a still-dominant white mainstream culture — becomes therapeutically reinterpreted as a series of microaggressions, and for the ‘victim’ the cumulative effect of these microaggressions is tantamount to PTSD. I was a loud, opinionated 22-year-old with a penchant for leaving the country to deal with my problems. I pushed through the radical beliefs I’d acquired at Berkeley and found ways to justify the fact that I was contributing to an industry responsible for intense gentrification, displacing local communities struggling to survive in the spaces they’ve lived their whole lives. I ignored the silent, nagging voice in the back of my head reminding me that my Southeast-Asian community was being decimated as I benefited from this unjust system. In my first month, I met a handful of strong and talented women of color who gave me a sense of community. During my first project, a brilliant Latina writer took me under her wing after we spotted each other across the room at a meeting. Sensing my isolation in the workplace, she told me we should get lunch, and I immediately felt more comfortable. She gave me pep talks when I was ignored in meetings, pointed me to other women and men who would help me grow, and infused me with hope in moments I got frustrated with the primarily white population of my department. Notice the tribal visual cues, the nonverbal communication, based on race (non-white). To SJWs like Yu, whiteness is the unit from which everything is measured. Practically every day that passed, older, married men stared at my body. My whole life has been caught in a feedback loop of battling the public perceptions of the very internet persona I created to feel safe. Translation: Yu posts sexualized pictures of herself online (even today) because… who knows. But her stripper-like self-esteem issues are definitely someone else’s fault (high school bullies; wypipo; Drumpf) and she is the victim here. And don’t you forget it. Ms Yu working hard to ensure no one stares at her. Meetings were dominated by white males droning on and on, often talking over their female counterparts or ignoring them altogether. White women sometimes seemed to feel like they were competing against you, rather than working with you. All those awful Biffs & Beckys (err… I mean Ezras & Evies). How did she ever survive? 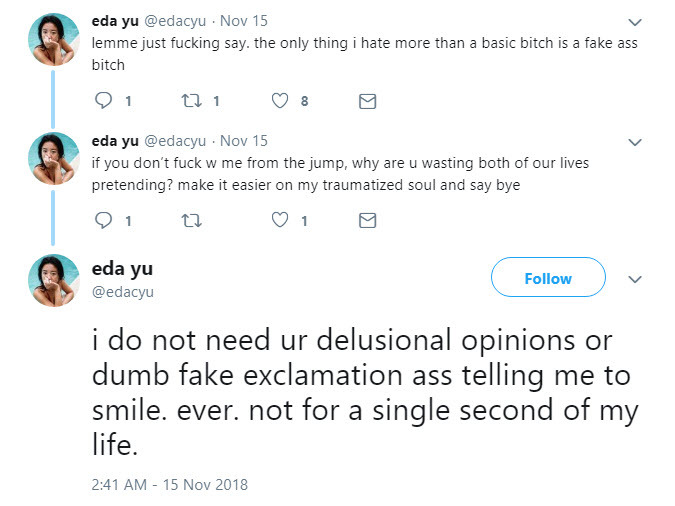 Ms. Yu is even angry that fellow Lib coworkers notice her extreme degree of SJW Wokeness! Worse yet was when people assumed I was their guru for all things “young and woke,” turning to me for insight on everything from how to decode popular memes to explaining the meaning of SoundCloud rap and identity politics in the Bay. Not everyone treated me this way. But these were themes that repeated time and again in the white, corporate tech spaces in which I worked. So, despite these companies’ attempts to foster a liberal and inclusive culture, I often endured the strange experience of being surrounded by people who seemed to share my ideals, but would always fall a little short of truly understanding me. A natural question for the rest of us is: How does one become someone like this, someone who ascribes the most minute and irrelevant social dynamics as ‘microaggressions’, someone this sexually and racially confused, someone this miserable? This entry was posted in Anti-White, Asian, Political Correctness. Bookmark the permalink.